Confocal.nl are running a series of workshops on their ground-breaking technology, Re-scan Confocal Microscope (RCM). With a camera-based detection scheme, RCM offers an easy-to-use confocal system with high resolution and sensitivity in a cost-effective package tuned to the needs of the individual user. The meetings allow participants to test the system with their own samples and to have plenty of time to ask questions. There are no special requirements for sample preparation, only that the sample may be excited with wavelengths of 405, 488, 561 or 638 nm. Registration is free to participants. To find out when there will be a workshop in your area, please visit Confocal.nl’s web site. Confocal.nl is also happy to organise a workshop at other locations. On-line demonstrations may also be arranged. 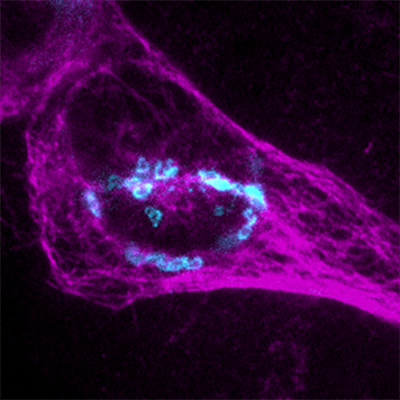 Please visit Confocal.nl image gallery for images taken during workshops. de Leeuw, Hessel & Piersma: Look-alikes may not act alike: Gene expression regulation and cell-type-specific responses of three valproic acid analogues in the neural embryonic stem cell test (ESTn). Toxicology Letters, Volume 303, 15 March 2019, Pages 28-37. Murine embryonic stem cells differentiated into neurons and supporting cells. Blue = DAPI, Green = VGlut2, which is a marker for synaptic vesicles that reside in neurons. Red = beta-III-tubulin. Images courtesy of Victoria de Leeuw, de Leeuw et al 2019. Please send us your publications and images taken with RCM: we value your research! RCM technology: De Luca et al (2013) Biomed Opt Express. The IXth Bangalore Microscopy course took place at the National Centre for Biological Sciences in Bangalore, India, 17-24 September. This highly practical course brought together world leaders in biological microscopy, both scientists, as well as manufacturers of state-of-the art equipment, and combined the lectures with hands-on sessions. The topics covered during the course ranged from basic microscopy to super-resolution techniques, the latter was represented by prof. Erik Manders, cofounder of Confocal.nl, and the Re-scan Confocal Microscope. Erik explaining the students the Re-scan principle during the workshops. During the Bangalore course, students learn how the microscope works. And there is no better way to learn that than building one from the scratch. This group managed to build a microscope that included a condensor, field stops, apertures and camera. It was not only educative, but also great fun! !